I'm finally playing through Donkey Kong Country: Tropical Freeze on the Wii U a good 10 months or so after it released. It's a great game, maybe even better than Returns, and if you are into that kind of thing you should definitely play it. One of the coolest things about Tropical Freeze is that it marks the return of legendary composer David Wise to the Donkey Kong Country series. David Wise composed the original soundtracks (OSTs) for the first two games in the SNES trilogy and parts of the third (although not Donkey Kong Country Returns on the Wii, which was handled by Metroid Prime composer Kenji Yamamoto, among others.) So I felt like it was time to give David Wise some much deserved love. And maybe some love for Yamamoto and his team as well. But mostly for David Wise, because that dude's Donkey Kong Country tracks are the best. One quick ground rule for this list: I will only include multiple versions of the same track if they offer something substantially different from each other. The Donkey Kong Country series has a lot of great remixes in it, yet some of them stick very close to the source material, so it wouldn't make much sense to include both versions on the list. I'm going to start at the beginning here. But also the end. That is to say, the end credits track from the first Donkey Kong Country game. This song always had a perfect mix of emotion and optimism, making it a good fit for the end of a hard fought battle. The Chariots-of-Fire-esque (it's a word!) delay on the drums gets to me every time. It's a short and subtle track, but it works. There are probably some people who are going to complain that I put this fan favorite so low on my list, but hey, that's not saying it's a bad song, because it's excellent! I just liked other tracks even more. Still, you can't deny the haunting beauty of this track, which fits perfectly with the claustrophobic openness of an underwater stage. The whining synths almost remind me of Resident Evil music at times, but with only a hint of that creepiness. The rest is just raw beauty. Sure, it could almost be seen as a remix of the super emotional Lord of the Rings track that plays right after Gandalf falls, and it wouldn't be the first, as pretty much like every other slow emotional song in every form of media uses that same basic chord progression now (with slight modifications.) But so what? So many composers use it because it works. It's an instant tear-jerker. Throw some Spanish guitar on top of it and you have one of the best tracks from the new era of Donkey Kong Country games. Another classic track from the original Donkey Kong Country, Fear Factory demonstrated the range of David Wise, managing to be both tense and rocking at the same time. It made me feel like I was deep in enemy territory (it played later in the game during the Kremling factory levels) with dangers all around me, but that I would be able to deal with whatever was thrown at me. Definitely one of the more powerful tracks in the first game. You may have been reading up to this point and wondering "where the heck are the Donkey Kong Country 2 tracks?!" Worry not, for rest assured I most definitely appreciate the greatness of the Donkey Kong Country 2 soundtrack. Hot-Head Bop was always one of my favorites. I love the tonal shift between the more somber "verse" sections and the upbeat, piano-driven "chorus" sections. The sweet breakdown in between doesn't hurt either. Here we have another Donkey Kong Country song that uses a pretty common chord progression. The Steve Miller band, for instance, used it many years before Donkey Kong Country was even a thing. Once again though, who cares? It gets used a lot because it works. In the case of the Donkey Kong Country track, it starts off as a kind of goofy piratey song, but quickly changes into something much more serious and dramatic. And that is when you know it's about to get real. So good. I feel like this track is one of the most criminally underrated in all of the Donkey Kong Country series. This may be due to the fact that (if I recall correctly) it is only heard during the ice stages of Donkey Kong Country 2, which only exist in the "hidden" bonus world, so it is possible to finish the game without ever hearing it. I feel sorry for those who did that. (NOTE: I have since been informed that this track is indeed in the main game. So I guess I did not recall correctly.) Slow and beautiful, In a Snow-Bound Land perfectly fits the frozen ice world. There is really only one David Wise track that does the slow and beautiful thing better. You know which track I speak of. It might even end up on my list. I have to admit, this track surprised me. When it first started playing in Tropical Freeze, I thought it was a brand new, upbeat track. Good, but nothing that would have made my list. That is, however, until the "chorus", where it breaks into a remix of the aforementioned "In a Snow-Bound Land", managing to retain its upbeat poppiness while pulling in the emotion of that track. I can't stop listening to this track over and over, a fact that probably annoys my girlfriend. This may be my only Donkey Kong Country Returns (aka non-David-Wise) track, but what a track! I love that I can hear a bit of the Metroid Prime style in this one (Yamamoto's influence? ), especially in the lead synths, mixed in with the more melodic style of the Donkey Kong Country series. 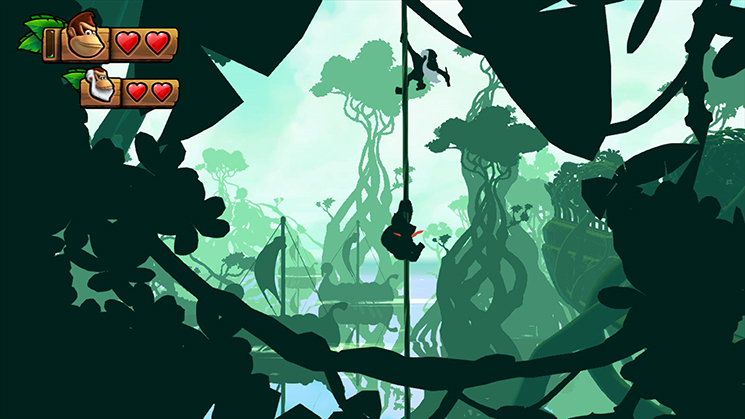 It doesn't hurt that this track is from a stage where everything is set to the beat of the song, making it the only Donkey Kong Country stage that incorporates the music into the gameplay. The breakdowns in this track are so sick too. Sick I say. PS. It may not be originally obvious, but this track is actually a remix of "Fear Factory". Yeah yeah, it is a very predictable choice for my number one spot. But you know what? It is predictable for a reason. Because Stickerbrush Symphony is not just the best Donkey Kong Country track, but it is one of the best video game songs ever made. It is kind of the epitome of David Wise's style at its best; gentle and passionate, with great use of both synths and pianos. To be honest I don't think a song like this could even exist outside of video game music. And when the drums kick in a bit after the minute mark, it is glorious. There you go, my top 10 list of Donkey Kong Country music tracks. To be quite honest it was a very tough list to put together, and I had to leave out many excellent tracks. Check below to see my runner-ups. And don't forget to comment. Agree or disagree? Which are your favorites? Cranky's Theme (Donkey Kong Country), Funky's Fugue (Donkey Kong Country), Theme (Title) (Donkey Kong Country), Bayou Boogie (Donkey Kong Country 2), Flight of the Zinger (Donkey Kong Country 2), Forest Interlude (Donkey Kong Country 2), Funky the Main Monkey (Donkey Kong Country 2), Mining Melancholy (Donkey Kong Country 2), Wrinkly 64 (Donkey Kong Country 3), Factory Friction (Donkey Kong Country Returns), Tidal Terror (Donkey Kong Country Returns), Alpine Incline (Donkey Kong Country: Tropical Freeze), Amiss Abyss (Donkey Kong Country: Tropical Freeze), Aqueduct Assault (Donkey Kong Country: Tropical Freeze), Busted Bayou (Donkey Kong Country: Tropical Freeze), Windmill Hills (Donkey Kong Country: Tropical Freeze), and tons and tons of remixes. And probably other songs that I'm forgetting about. This thread is my jam. @Hinph That was totally in my Runner-Ups! Don't you READ ANYTHING?! No final music from DKC2. List invalid. Runner-up? Is that really what you feel in your heart? This is my fave song from DKC: Tropical Freeze. Really gives Aquatic Ambience a run for its money in the water-level department. No Grassland Groove? You think it's too gimmicky or something? I freaked out at it the first time I hit this level. Nintendo should steal all of Rare's former composers. Damn, that company killed it with soundtracks since the NES days. @anon_mastermind Ah. Why was I under the impression that it was only in the bonus area?! Well, I guess it isn't more popular because people are dumb and have bad taste. @kriswright I'm a Nintendo fan, there is no such thing as too gimmicky. I probably would add that one to the Runner-Up list, but top 10? Not quite there. I thought DKC 3 had a new composer and that's why the music was a little different. Interestingly, only two of these would be on my own list, Hot-Head Hop and Bramble Blast. This song, mixed in with the visuals of that stage, was really somethin'. Definitely a top five for me, and one I'd put above Aquatic Ambiance. The soundtrack was composed by Eveline Fischer and David Wise, with Fischer producing most of the game's music. Hmm. None of my favorites. Not to knock her, her stuff is good, but it's no David Wise. Ice Cave Chant is probably my favorite of those tracks. Zero hates female composers, confirmed. Zero hates male composers, confirmed. Well you gotta hate one or the other. Pick a side, you filthy fence-sitter.